Commentators of the Shulḥan 'Aruk. Anti-Semitic Attacks on the Shulhan 'Aruk. The last great codifier of rabbinical Judaism, born in Spain or Portugal in 1488; died at Safed, Palestine, March 24, 1575. After the expulsion of the Jews from Spain, in 1492, Caro went with his parents to Nicopolis in European Turkey, where he received his first instruction from his father, who was himself an eminent Talmudist. He married, first, Isaac Saba's daughter, and, after her death, the daughter of Ḥayyim Albalag, both of these men being well-known Talmudists. After the death of his second wife he married the daughter of Zechariah Sechsel (Sachsel? ), a learned and wealthy Talmudist. Between 1520 and 1522 Caro settled at Adrianople, where he probably met the enthusiast Solomon Molcho, who stimulated his mystical tendencies. When the latter died at the stake in 1532, Caro also was filled with a longing to be "consumed on the altar as a holy burnt offering," to sanctify the name of God by a martyr's death. Like Molko, Caro had fantastic dreams and visions, which he believed to be revelations from a higher being. His genius, , he thought, was nothing less than the Mishnah personified, which instructed him because he had devoted himself to its service. These mystical tendencies probably induced Caro to emigrate to Palestine, where he arrived about 1535, having en route spent several years at Salonica (1533) and Constantinople. At Safed he met Jacob Berab, who exerted a great influence upon him, Caro becoming an enthusiastic supporter of Berab's plans for the restitution of ordination. After Berab's death Caro tried to carry out these plans, ordaining his pupil Moses Alshech; but he finally gave up his endeavors, convinced that he could not overcome the opposition to ordination (compare his "Kesef Mishneh," on Sanh. iv., where his silence regarding this point is significant). However, his aspiration to be regarded as the highest authority in Judaism was practically realized; for his reputation during the last thirty years of his life was greater than that of almost any other rabbi since Maimonides. The Italian Azariah dei Rossi, though his views differed widely from Caro's, collected money among the rich Italian Jews for the purpose of having a work of Caro's printed ("Me' or 'Enayim," xxiii., ed. Benjacob, i. 241); and the Pole Moses Isserles compelled the recognition of one of Caro's decisions at Cracow, although he thought Caro was wrong (Isserles, Responsa, No. 48). When some members of the community of Carpentras, in France, believed themselves to have been unjustly treated by the majority in a matter relating to taxes, they appealed to Caro, whose letter was sufficient to restore to them their rights ("Rev. Etudes Juives," xviii. 133-136). In the East, Caro's authority was, if possible, even greater. His name heads the decree of excommunication directed against Daud, Joseph Nasi's agent (Responsa of Elijah b. Ḥayyim, "Mayim 'Amuḳḳim," No. 56);and it was Caro who condemned Dei Rossi's "Me'or 'Enayim" to be burned (Azulai, "Maḥaziḳ Berakah," p. 133). Caro's death, therefore, caused general mourning; and several funeral orations delivered on that occasion have been preserved (Moses Albelda, "Darash Mosheh"; Samuel Katzenellenbogen, "Derashot"), as well as some elegies (anonymous, see "Rev. Etudes Juives," ix. 304, 305; x. 317; Moscato, in "Oẓar Neḥmad," iii. 167; and biography of Moscato by Apfelbaum, p. 56). Caro published during his lifetime: "Bet Yosef" (House of Joseph), in four parts—(i., ii.) Venice, 1550-1551; (iii., iv.) Sabbionetta, 1553-59; Shulḥan 'Aruk, in four parts, Venice, 1565 (according to Steinschneider's Catalogue, col. 1480, the composition of the Shulḥan 'Aruk was completed at Biri, Palestine, 1555); "Kesef Mishneh" (Double Money), Venice, 1574-75. After his death there appeared: "Bedeḳ ha-Bayit" (Repairing of the House), supplements and corrections to "Bet Yosef," Salonica, 1605; "Kelale ha-Talmud" (Methodology of the Talmud), ib., 1598; "Abḳat Rokel" (Powder of the Merchant), Responsa, ib. 1791; Responsa, ib. 1597; "Maggid Mesharim" (Who Preaches Rightly), Lublin, 1646; supplements to the same, Venice, 1654; "Derashot," Salonica, 1799, in the collection "'Oz Ẓaddiḳim" (The Power of the Righteous). Caro also left a commentary upon the Mishnah, as well as supercommentaries to Rashi's and Naḥmanides' commentaries on the Pentateuch, which have, apparently, not been preserved. The Bodleian Library contains some smaller literary fragments by Caro not yet published. 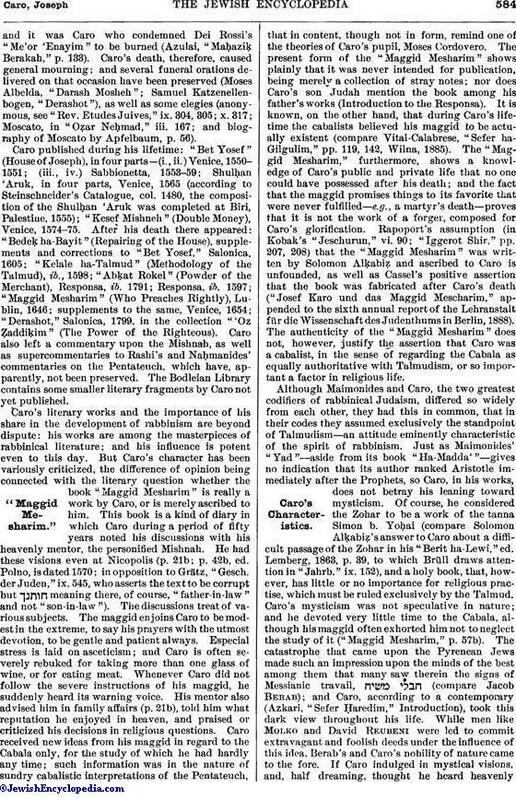 Caro's literary works and the importance of his share in the development of rabbinism are beyond dispute: his works are among the masterpieces of rabbinical literature; and his influence is potent even to this day. But Caro's character has been variously criticized, the difference of opinion being connected with the literary question whether the book "Maggid Mesharim" is really a work by Caro, or is merely ascribed to him. This book is a kind of diary in which Caro during a period of fifty years noted his discussions with his heavenly mentor, the personified Mishnah. He had these visions even at Nicopolis (p. 21b; p. 42b, ed. Polno, is dated 1570; in opposition to Graätz, "Gesch. der Juden," ix. 545, who asserts the text to be corrupt but meaning there, of course, "father-in-law" and not "son-in-law"). The discussions treat of various subjects. The maggid enjoins Caro to be modest in the extreme, to say his prayers with the utmost devotion, to be gentle and patient always. Especial stress is laid on asceticism; and Caro is often severely rebuked for taking more than one glass of wine, or for eating meat. Whenever Caro did not follow the severe instructions of his maggid, he suddenly heard its warning voice. His mentor also advised him in family affairs (p. 21b), told him what reputation he enjoyed in heaven, and praised or criticized his decisions in religious questions. Caro received new ideas from his maggid in regard to the Cabala only, for the study of which he had hardly any time; such information was in the nature of sundry cabalistic interpretations of the Pentateuch, that in content, though not in form, remind one of the theories of Caro's pupil, Moses Cordovero. The present form of the "Maggid Mesharim" shows plainly that it was never intended for publication, being merely a collection of stray notes; nor does Caro's son Judah mention the book among his father's works (Introduction to the Responsa). It is known, on the other hand, that during Caro's lifetime the cabalists believed his maggid to be actually existent (compare Vital-Calabrese, "Sefer ha-Gilgulim," pp. 119, 142, Wilna, 1885). 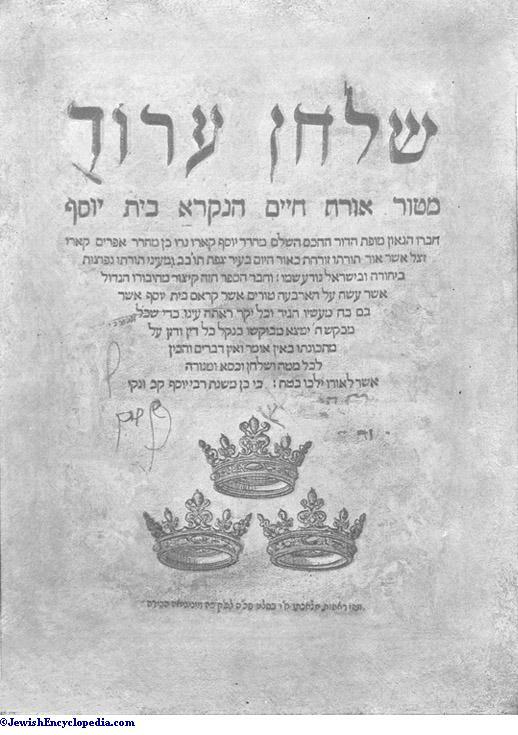 The "Maggid Mesharim," furthermore, shows a knowledge of Caro's public and private life that no one could have possessed after his death; and the fact that the maggid promises things to its favorite that were never fulfilled—e.g., a martyr's death—proves that it is not the work of a forger, composed for Caro's glorification. Rapoport's assumption (in Kobak's "Jeschurun," vi. 90; "Iggerot Shir," pp. 207, 208) that the "Maggid Mesharim" was written by Solomon Alḳabiẓ and ascribed to Caro is unfounded, as well as Cassel's positive assertion that the book was fabricated after Caro's death ("Josef Karo und das Maggid Mescharim," appended to the sixth annual report of the Lehranstalt für die Wissenschaft des Judenthums in Berlin, 1888). The authenticity of the "Maggid Mesharim" does not, however, justify the assertion that Caro was a cabalist, in the sense of regarding the Cabala as equally authoritative with Talmudism, or so important a factor in religious life. Although Maimonides and Caro, the two greatest codifiers of rabbinical Judaism, differed so widely from each other, they had this in common, that in their codes they assumed exclusively the standpoint of Talmudism—an attitude eminently characteristic of the spirit of rabbinism. Just as Maimonides' "Yad"—aside from its book "Ha-Madda'"—gives no indication that its author ranked Aristotle immediately after the Prophets, so Caro, in his works, does not betray his leaning toward mysticism. Of course, he considered the Zohar to be a work of the tanna Simon b. Yoḥai (compare Solomon Alḳabiẓ's answer to Caro about a difficult passage of the Zohar in his "Berit ha-Lewi," ed. 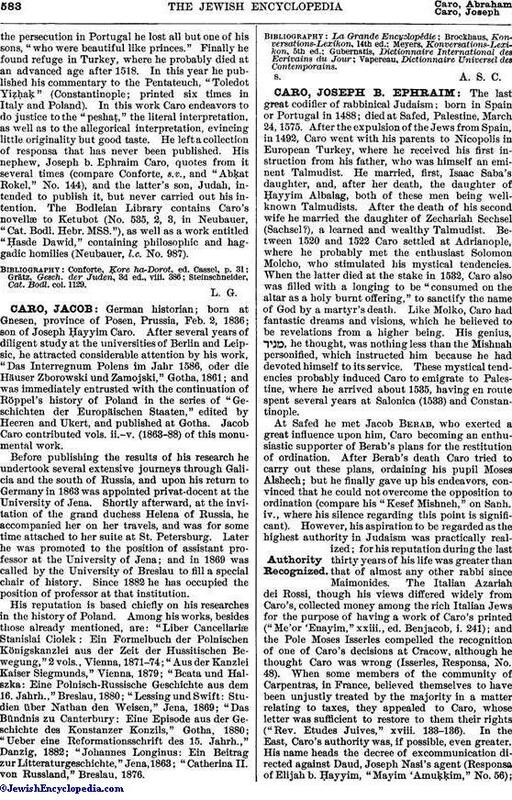 Lemberg, 1863, p. 39, to which Brüll draws attention in "Jahrb." ix. 152), and a holy book, that, however, has little or no importance for religious practise, which must be ruled exclusively by the Talmud. Caro's mysticism was not speculative in nature; and he devoted very little time to the Cabala, although his maggid often exhorted him not to neglect the study of it ("Maggid Mesharim," p. 57b). The catastrophe that came upon the Pyrenean Jews made such an impression upon the minds of the best among them that many saw therein the signs of Messianic travail, (compare Jacob Berab); and Caro, according to a contemporary (Azkari, "Sefer Ḥaredim," Introduction), took this dark view throughout his life. While men like Molko and David Reubeni were led to commit extravagant and foolish deeds under the influence of this idea. Berab's and Caro's nobility of nature came to the fore. If Caro indulged in mystical visions, and, half dreaming, thought he heard heavenlyvoices in his soul, they served always as reminders to him that his life, his actions, and his accomplishments must surpass those of other people (ib. "Toledot," p. 9; "Azharot," p. 3b, and passim). Caro's mysticism stimulated rather than hindered his activity, urging him on to great works. While Caro's teacher, Berab, had attempted to create a spiritual center for the Jews scattered throughout the world, by reestablishing ordination, Caro tried to carry out the same idea in a different way. Although Caro is known to later times chiefly as the author of the Shulḥan 'Aruk, yet his earlier "Bet Yosef" marked him as one of the greatest Talmudists of all times. He began the book in 1522 at Adrianople, finished it in 1542 at Safed, and published it in 1550-59. 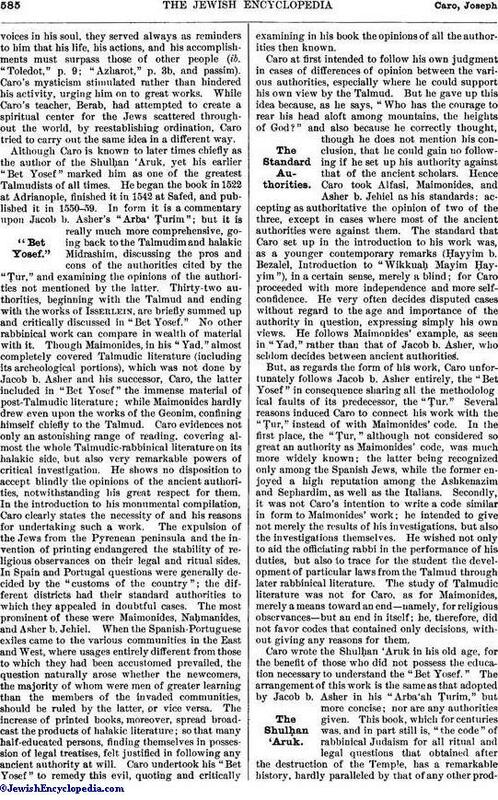 In form it is a commentary upon Jacob b. Asher's "Arba' Ṭurim"; but it is really much more comprehensive, going back to the Talmudim and halakic Midrashim, discussing the pros and cons of the authorities cited by the "Ṭur," and examining the opinions of the authorities not mentioned by the latter. Thirty-two authorities, beginning with the Talmud and ending with the works of Isserlein, are briefly summed up and critically discussed in "Bet Yosef." No other rabbinical work can compare in wealth of material with it. Though Maimonides, in his "Yad," almost completely covered Talmudic literature (including its archeological portions), which was not done by Jacob b. Asher and his successor, Caro, the latter included in "Bet Yosef" the immense material of post-Talmudic literature; while Maimonides hardly drew even upon the works of the Geonim, confining himself chiefly to the Talmud. Caro evidences not only an astonishing range of reading, covering almost the whole Talmudic-rabbinical literature on its halakic side, but also very remarkable powers of critical investigation. He shows no disposition to accept blindly the opinions of the ancient authorities, notwithstanding his great respect for them. In the introduction to his monumental compilation, Caro clearly states the necessity of and his reasons for undertaking such a work. The expulsion of the Jews from the Pyrenean peninsula and the invention of printing endangered the stability of religious observances on their legal and ritual sides. In Spain and Portugal questions were generally decided by the "customs of the country"; the different districts had their standard authorities to which they appealed in doubtful cases. The most prominent of these were Maimonides, Naḥmanides, and Asher b. Jehiel. When the Spanish-Portuguese exiles came to the various communities in the East and West, where usages entirely different from those to which they had been accustomed prevailed, the question naturally arose whether the newcomers, the majority of whom were men of greater learning than the members of the invaded communities, should be ruled by the latter, or vice versa. The increase of printed books, moreover, spread broadcast the products of halakic literature; so that many half-educated persons, finding themselves in possession of legal treatises, felt justified in following any ancient authority at will. Caro undertook his "Bet Yosef" to remedy this evil, quoting and critically examining in his book the opinions of all the authorities then known. Caro at first intended to follow his own judgment in cases of differences of opinion between the various authorities, especially where he could support his own view by the Talmud. But he gave up this idea because, as he says, "Who has the courage to rear his head aloft among mountains, the heights of God?" and also because he correctly thought, though he does not mention his conclusion, that he could gain no following if he set up his authority against that of the ancient scholars. Hence Caro took Alfasi, Maimonides, and Asher b. Jehiel as his standards; accepting as authoritative the opinion of two of the three, except in cases where most of the ancient authorities were against them. The standard that Caro set up in the introduction to his work was, as a younger contemporary remarks (Ḥayyim b. Bezalel, Introduction to "Wikkuaḥ Mayim Ḥayyim"), in a certain sense, merely a blind; for Caro proceeded with more independence and more self-confidence. He very often decides disputed cases without regard to the age and importance of the authority in question, expressing simply his own views. He follows Maimonides' example, as seen in "Yad," rather than that of Jacob b. Asher, who seldom decides between ancient authorities. But, as regards the form of his work, Caro unfortunately follows Jacob b. Asher entirely, the "Bet Yosef" in consequence sharing all the methodological faults of its predecessor, the "Ṭur." Several reasons induced Caro to connect his work with the "Ṭur," instead of with Maimonides' code. In the first place, the "Ṭur," although not considered so great an authority as Maimonides' code, was much more widely known; the latter being recognized only among the Spanish Jews, while the former enjoyed a high reputation among the Ashkenazim and Sephardim, as well as the Italians. Secondly, it was not Caro's intention to write a code similar in form to Maimonides' work; he intended to give not merely the results of his investigations, but also the investigations themselves. He wished not only to aid the officiating rabbi in the performance of his duties, but also to trace for the student the development of particular laws from the Talmud through later rabbinical literature. The study of Talmudic literature was not for Caro, as for Maimonides, merely a means toward an end—namely, for religious observances—but an end in itself; he, therefore, did not favor codes that contained only decisions, without giving any reasons for them. Caro wrote the Shulḥan 'Aruk in his old age, for the benefit of those who did not possess the education necessary to understand the "Bet Yosef." The arrangement of this work is the same as that adopted by Jacob b. Asher in his "Arba'ah Ṭurim," but more concise; nor are any authorities given. This book, which for centuries was, and in part still is, "the code" of rabbinical Judaism for all ritual and legal questions that obtained after the destruction of the Temple, has a remarkable history, hardly paralleled by that of any other productof rabbinical literature. The author himself had no very high opinion of the work, remarking that he had written it chiefly for ("young students," Shulḥan 'Aruk, Introduction). He never refers to it in his responsa, but always to the "Bet Yosef." The Shulḥan 'Aruk, achieved its reputation and popularity not only against the wishes of the author, but, curiously enough, through the very scholars who attacked it. The history of the Shulḥan 'Aruk is, in a way, identical with the history of rabbinical literature in Poland for a period of two centuries. Recognition or denial of Caro's authority lay entirely with the Polish Talmudists. Germany had been forced to give way to Poland as early as the beginning of the sixteenth century; and in the last third of that century the East had become so entirely absorbed in the new cabalistic school of Luria that the study of the Talmud was greatly neglected. Caro was opposed in the East only by his contemporaries, Yom-Ṭob Zahalon, who designated the Shulḥan 'Aruk as a book for ("children and ignoramuses"; see his Responsa, No. 67, beginning), and Jacob Castro, whose work "'Erek ha-Shulḥan" consists of critical glosses to the Shulḥan 'Aruk. Isserles and Solomon Luria were Caro's first important adversaries. Although the opposition of these two men was different in kind and due to different motives, it may be regarded in a measure as the protest of the Ashkenazim against the supremacy of the Sephardim. The Ashkenazim—first the German, and then the Polish—were much more scrupulous in matters of ritual than their Spanish-Portuguese brethren; hence they considered that Caro's "Bet Yosef" contained dangerous innovations, as the authorities he followed were chiefly Sephardim, whose opinions did not prevail among the Ashkenazim. Immediately upon the appearance of Caro's "Bet Yosef," Isserles wrote his "Darke Mosheh," a moderately expressed but very severe criticism of Caro's great work. In place of Caro's three standard authorities, Isserles brings forward the ("the later authorities"), together with the Franco-German Tosafists as criteria of opinion ("Darke Mosheh" to Yoreh De'ah, 35). The importance of the Minhag ("prevailing local custom") is also a point of dispute between Caro and Isserles: while the former held fast to original authorities and material reasons, the latter considered the minhag as an object of great importance, and not to be omitted in a codex. This point, especially, induced Isserles to write his glosses to the Shulḥan 'Aruk, that the customs (minhagim) of the Ashkenazim might be recognized, and not be set aside through Caro's reputation. If Abraham b. David's criticism of Maimonides' code be compared with Isserles' criticism of Caro's Shulḥan 'Aruk, the question suggests itself why the Shulḥan 'Aruk became an authoritative code, in spite of opposition and against the will of its author, while Maimonides' "Yad" found no acceptance among the Franco-German Jews, owing to Abraham b. David's criticism and influence. The answer lies in the fact that the keen and, in part, just criticism by Rabad destroyed confidence in Maimonides' "Yad," while Isserles was not content only to criticize, but supplemented Caro's work extensively, with the result that the Ashkenazim then accepted the Shulḥan 'Aruk, assuming that in its corrected form it was an unquestionable authority. Solomon Luria's opposition to Caro's code was due to entirely different motives. Luria shared Isserles' great respect for the French scholars, whom he placed above the Sephardic; but he held that "since the completion of the Talmud no opinion that can not be deduced from the Talmudim or the halakic Midrashim can claim to be authoritative"—a view so novel and daring that Luria found few supporters even among his own countrymen, and his "Yam Shel Shelomoh" was not enough to deprive Caro's works of their authority. The Shulḥan 'Aruk with Isserles' supplements was so popular, and enjoyed such great authority even so early as the last third of the sixteenth century, that Ḥayyim b. Bezalel's attacks on it were also without effect. 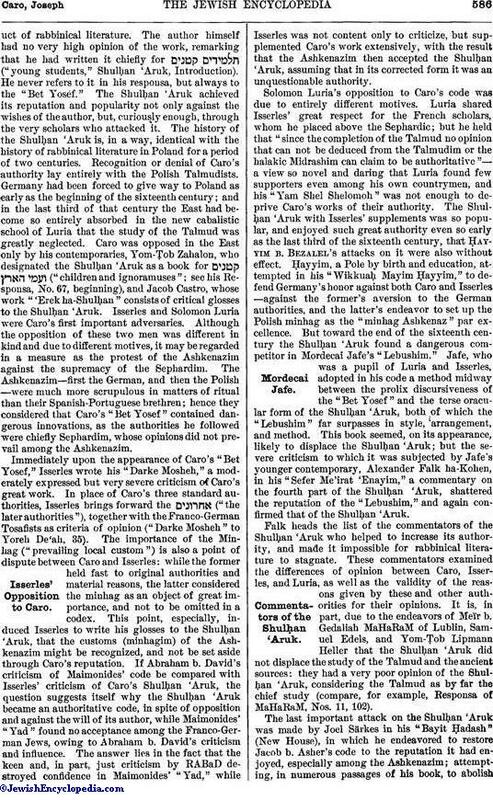 Ḥayyim, a Pole by birth and education, attempted in his "Wikkuaḥ Mayim Ḥayyim," to defend Germany's honor against both Caro and Isserles—against the former's aversion to the German authorities, and the latter's endeavor to set up the Polish minhag as the "minhag Ashkenaz" par excellence. But toward the end of the sixteenth century the Shulḥan 'Aruk found a dangerous competitor in Mordecai Jafe's "Lebushim." Jafe, who was a pupil of Luria and Isserles, adopted in his code a method midway between the prolix discursiveness of the "Bet Yosef" and the terse oracular form of the Shulḥan 'Aruk, both of which the "Lebushim" far surpasses in style, 'arrangement, and method. This book seemed, on its appearance, likely to displace the Shulḥan 'Aruk; but the severe criticism to which it was subjected by Jafe's younger contemporary, Alexander Falk ha-Kohen, in his "Sefer Me'irat 'Enayim," a commentary on the fourth part of the Shulḥan 'Aruk, shattered the reputation of the "Lebushim," and again confirmed that of the Shulḥan 'Aruk. Falk heads the list of the commentators of the Shulḥan 'Aruk who helped to increase its authority, and made it impossible for rabbinical literature to stagnate. These commentators examined the differences of opinion between Caro, Isserles, and Luria, as well as the validity of the reasons given by these and other authorities for their opinions. It is, in part, due to the endeavors of Meïr b. Gedaliah MaHaRaM of Lublin, Samuel Edels, and Yom-Ṭob Lipmann Heller that the Shulḥan 'Aruk did not displace the study of the Talmud and the ancient sources: they had a very poor opinion of the Shulḥan 'Aruk, considering the Talmud as by far the chief study (compare, for example, Responsa of MaHaRaM, Nos. 11, 102). Title-Page of the First Edition of Caro's Shulḥan 'Aruk, Printed at Venice, 18th of Kislew, 5325=1564. The last important attack on the Shulḥan 'Aruk was made by Joel Särkes in his "Bayit Ḥadash" (New House), in which he endeavored to restore Jacob b. Asher's code to the reputation it had enjoyed, especially among the Ashkenazim; attempting, in numerous passages of his book, to abolish the customs introduced in many places under the combined influence of Caro and Isserles (BaḤ to Yoreh De'ah, 279; Responsa, No. 80 [new series 42]). But Joel succeeded as little as his master, Luria, in his opposition to Caro and Isserles. The battle raging around the Shulḥan 'Aruk lasted for nearly a hundred years, its authority not being firmly established until the middle of the seventeenth century, which date also marks the beginning of the commentaries to it, the period of the so-called Aḥaronim. Moses Lima b. Isaac, David b. Samuel ha-Levi, Shabbethai b. Meïr ha-Kohen, Abraham Abele Gombiner, and Samuel b. Uri Phoebus of Wavdyslav, all of the seventeenth century, are the classical commentators of the Shulḥan 'Aruk. They differ in their relation to Caro and Isserles, though all the Aḥaronim fully and unreservedly recognized the authority of both. Moses Lima held that no one was entitled to decide any cases according to the Shulḥan 'Aruk "who was not at the same time competent to expunge entire paragraphs from it" (Emden, "She'elat Ya'abeẓ," ii., No. 20, end), while David b. Samuel, although a pupil and son-in-law of Joel Särkes, held that no decision of the Shulḥan 'Aruk was under any circumstances a criterion to be literally followed (Yoreh De'ah, 48, 5). Shabbethai b. Meïr's relation to the Shulḥan 'Aruk is a peculiar one. One of the keenest minds among the Rabbis, he was the warmest defender of Caro and Isserles against the attacks of the Aḥaronim; while he himself unsparingly attacked not only the Shulḥan 'Aruk, but also all the post-Talmudic authorities. Although all these men thus preserved a certain independence toward the work, they yet confirmed its authority by making it the basis of their own works and by undertaking to explain it. 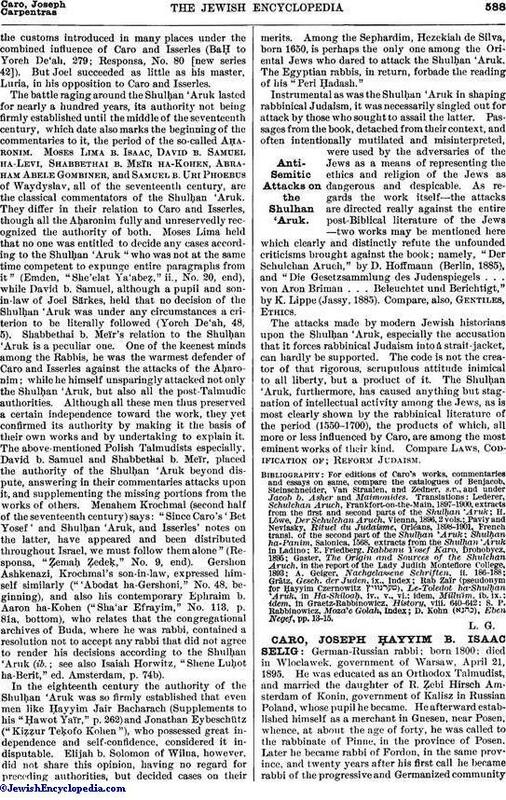 The above-mentioned Polish Talmudists especially, David b. Samuel and Shabbethai b. Meïr, placed the authority of the Shulḥan 'Aruk beyond dispute, answering in their commentaries attacks upon it, and supplementing the missing portions from the works of others. Menahem Krochmal (second half of the seventeenth century) says: "Since Caro's 'Bet Yosef' and Shulḥan 'Aruk, and Isserles' notes on the latter, have appeared and been distributed throughout Israel, we must follow them alone" (Responsa, "Ẓemaḥ Ẓedeḳ," No. 9, end). Gershon Ashkenazi, Krochmal's son-in-law, expressed himself similarly ("'Abodat ha-Gershoni," No. 48, beginning), and also his contemporary Ephraim b. Aaron ha-Kohen ("Sha'ar Efrayim," No. 113, p. 81a, bottom), who relates that the congregational archives of Buda, where he was rabbi, contained a resolution not to accept any rabbi that did not agree to render his decisions according to the Shulḥan 'Aruk (ib. ; see also Isaiah Horwitz, "Shene Luḥot ha-Berit," ed. Amsterdam, p. 74b). In the eighteenth century the authority of the Shulḥan 'Aruk was so firmly established that even men like Ḥayyim Jair Bacharach (Supplements to his "Ḥawot Yaïr," p. 262) and Jonathan Eybeschütz ("Kiẓẓur Teḳofo Kohen"), who possessed great independence and self-confidence, considered it indisputable. Elijah b. Solomon of Wilna, however, did not share this opinion, having no regard for preceding authorities, but decided cases on their merits. Among the Sephardim, Hezekiah de Silva, born 1650, is perhaps the only one among the Oriental Jews who dared to attack the Shulḥan 'Aruk. The Egyptian rabbis, in return, forbade the reading of his "Peri Ḥadash." Instrumental as was the Shulḥan 'Aruk in shaping rabbinical Judaism, it was necessarily singled out for attack by those who sought to assail the latter. Passages from the book, detached from their context, and often intentionally mutilated and misinterpreted, were used by the adversaries of the Jews as a means of representing the ethics and religion of the Jews as dangerous and despicable. As regards the work itself—the attacks are directed really against the entire post-Biblical literature, of the Jews -two works may be mentioned here which clearly and distinctly refute the unfounded criticisms brought against the book; namely, "Der Schulchan Aruch," by D. Hoffmann (Berlin, 1885), and "Die Gesetzsammlung des Judenspiegels . . . von Aron Briman . . . Beleuchtet und Berichtigt," by K. Lippe (Jassy, 1885). Compare, also, Gentiles, Ethics. The attacks made by modern Jewish historians upon the Shulḥan 'Aruk, especially the accusation that it forces rabbinical Judaism into a strait-jacket, can hardly be supported. The code is not the creator of that rigorous, scrupulous attitude inimical to all liberty, but a product of it. 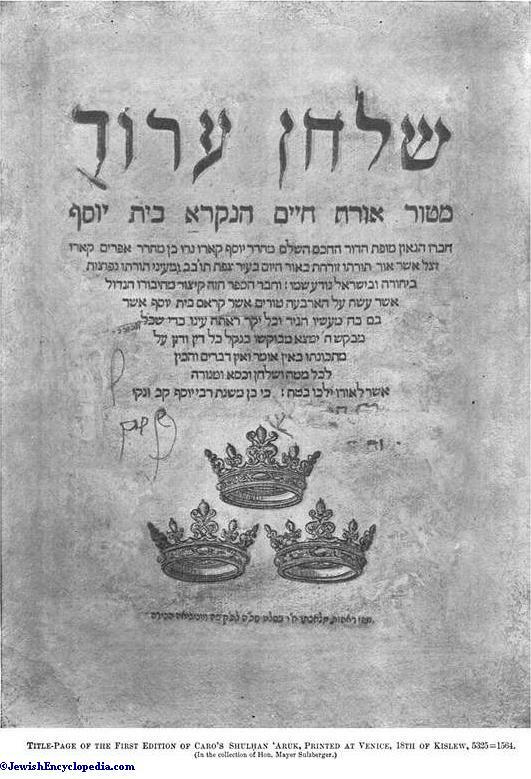 The Shulḥan 'Aruk, furthermore, has caused anything but stagnation of intellectual activity among the Jews, as is most clearly shown by the rabbinical literature of the period (1550-1700), the products of which, all more or less influenced by Caro, are among the most eminent works of their kind. Compare Laws, Codification of; Reform Judaism. For editions of Caro's works, commentaries and essays on same, compare the catalogues of Benjacob, Steinschneider, Van Straalen, and Zedner, s.v., and under Jacob b. Asher and Maimonides. D. Kohn ( ), Eben Negef, pp. 13-15.